After a delightful day and night in Johor Bahru, I was picked up on the morning of Thursday, October 1st at my hotel by the handling agent that had been assigned to me. He drove me back to the airport for the long flight to India. Preparation of the Mooney, including fueling the ferry tanks and clearing the necessary paperwork went very quickly and painlessly. I faced another delay, though, as soon as I climbed into the cockpit and requested permission to start the engine. Again, the airport was temporarily closed for a VIP arrival, and the controller said he'd radio back to me when it was OK for me to start up. It took almost a half hour before a BAC111 jet bearing Malaysian government markings touched down and was met by yet another impressive motorcade. I never found out who was on board, but the handling agent guessed it was Malaysia's Prime Minister. The government was in a bit of a turmoil at the time. A very popular deputy Prime Minister had been imprisoned and was being tried for various (possibly false) charges of sexual misbehavior, and the incumbent Prime Minister was crisscrossing the country in an attempt to shore up his government against a rising swell of public discontent over the arrest. I'll probably never know who the arriving VIP really was on that day, but he (or she) cost me an hour's delay in launching for Madras. Once I finally got airborne, a controller in JB's tower vectored me northward for my climbout. This presented an immediate problem, as there was a range of mountains cutting across my path in that direction, and at full ferry weight I would not be able to climb high enough to overfly them. Thankfully, my immediate appeal for assistance from the controller brought to the microphone a different, authoritarian voice (probably the tower supervisor) who understood the problem and cleared me for a low terrain flight path out toward the coast. He then added something else that I'd never heard from any ATC controller before. "Have a good flight, Captain Reed Prior. Please come back again next year!" What a wonderful salutation! I assumed that the speaker was one of the two gentlemen that Barry Andrews and I had met a few days earlier when we visited JB's tower. The 13.3 hour flight to Madras was largely uneventful, except for the presence of monsoon thunderstorm cells over the entire route. Deviations became the norm, rather than the exception. There was quite a bit of high altitude airline traffic along my route, mostly flying from Singapore or Australia behind me toward India or Europe up ahead. It was thus easy to get some help with weather detection. By calling ahead on the air-to-air VHF frequency to jets that were hundreds of miles further down the line, I was able to locate the more dense storm concentrations long before they came within the reach of my smaller radar scope. By planning route deviations well in advance, I could minimize the deviation angles and distances required. Based upon my 48 hours in India, I can vouch for the veracity of all the complaints by pilots about Indian bureaucratic hassles. I can also attest to the outrageous level of fees charged. It took me two hours after landing to fill out all the paperwork and be admitted to the country, and the only reason it went that quickly was by virtue of the assistance of my Indian handler, Indian Airlines, whose activities were in turn closely overseen by Jeppesen's assigned agent in India, Aviators Ltd. Countless forms had to be completed, all with multiple carbon (yes CARBON!) copies. The fee for Indian Airlines alone was $1,200 in US dollars CASH, and this didn't include landing, parking, weather service, fuel, Aviators Ltd., or other fees. Those all had to be paid in cash as well, and no one would accept the Indian Rupees I had purchased in Singapore, either. Not even Indian government agencies! Only genuine US dollars would do! Once I'd been released by the authorities to pass through the customs and immigration barriers at the airport, I was escorted by an Aviators Ltd. official named Gana through the throngs of street beggars to a waiting car and then on to my hotel. Along the way, Gana explained for the first time why I had been promised only 60 gallons of gas at my next stop in Trivandrum. In fact, that airport normally stocks no avgas at all, but Gana had learned that a small private flying club had a single trainer aircraft based at Trivandrum, and the club therefore had its own stock of avgas stored away in small barrels. Gana had persuaded the club to sell me one barrel of its fuel at cost, but he wasn't sure whether or not they could spare more. The club trucked its fuel in from a military installation a few hundred kilometers away, where they purchased it using funds from their meager treasury. Gana suggested I tour Madras the next day while he caught an airline flight down to Trivandrum to see if he could cajole more fuel out of the club. I had indicated that I would need about 150 gallons, not 60. He promised to do his best. He also cautioned me that the 48 hour limitation on my Indian landing and overflight permit had teeth in it, and that no matter what, I HAD TO LEAVE INDIA by the time it expired. The penalty for noncompliance would most likely be government seizure of the Mooney, followed by deportation (or worse) of me. Message received! The next day I arranged a tour of Madras with the hotel concierge. A well dressed former English professor named Sushila introduced herself as my tour guide, and she was accompanied by a uniformed driver who captained our half day ride through the city. We toured a major Hindu temple, a cathedral (reputed to house the remains of St. Thomas, the "doubting Thomas"), and various government buildings and monuments. We also drove by university campuses and through a number of neighborhoods. The poverty that greeted my eyes everywhere was very disturbing. People walked the streets barefoot, mingling with cows and other animals, and since there were no sidewalks (just wide, muddy streets), they also had to avoid being crushed by the swarm of honking and mostly recklessly driven vehicles. 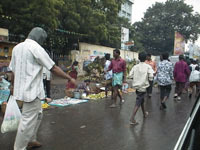 There were beggars on every corner, and the monsoon rains intermixed with both human and animal waste on the sloshy roadways to create the most unsanitary urban environment that I could even imagine. Yet, without exception everyone I met was remarkably friendly, despite my obviously foreign appearance. Like in Western Samoa, there appeared to be a tacit acceptance, if not contentment, with the conditions these people must endure each day. Enroute from Malaysia to India, I encountered a number of thunderstorm cells over the Indian Ocean. Here's a view of part of the instrument panel showing an area of precipitation echoes between 10 and 25 miles ahead on the weather radar (upper right), plus a few lightning strike indications on the stormscope (the green screen to the lower left, with strikes shown as little "+" signs). 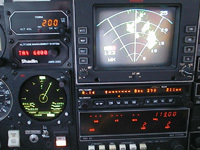 As displayed on the GPS satellite navigation computer under the radar indicator, I was already navigating 8.14 nautical miles to the left of the desired course to avoid the weather at the time of this picture, but both scopes showed that I would have to deviate still further to the left. It turned out that about 22 miles was enough to get around all the bad stuff. The first indication of the level of bureaucracy that would confront me in India. Upon my landing in Madras (now renamed Chennai by the Indian government), these men rushed out to the Mooney before the engine had even been shut down. Included are customs officials, an immigration officer, airport authorities, and representatives from the "handler" for my flight, Indian Airlines. Without the help of the latter I may never have gotten through all the paperwork in time to get any sleep that night. As it was, the post landing formalities took almost two hours. 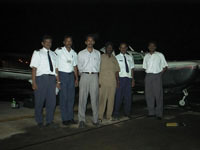 Driver Shiva (in the white uniform) and guide Sushila. These two gave me a personal tour of Madras (er, Chennai), India. Sushila is a very articulate and knowledgeable English instructor at a local university who gives tours to visiting business people as a side line. Her brother is an MIT engineering graduate presently residing in the States. 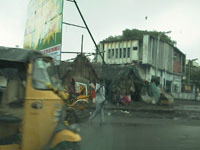 Street scene in Chennai (we'll use this name from now on). Note the sidewalk vendors, although there's no sidewalk. Vendors, pedestrians, untethered animals and cars all share the same ribbon of pavement. This is the only city I could recall where there was more horn honking than in New York. Drivers had to warn off nonchalant pedestrians and various "quadrupeds" that a vehicle was approaching. 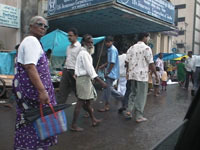 Another street scene. Note that everyone is either in sandals or barefoot. This, despite the presence of animal waste freely mixing in mud puddles with the falling rain water, is a fundamental indicator of the level of sanitation problems in this developing country. India's version of urban squatters. These thatched huts were erected on side streets by homeless and unemployed immigrants from the countryside who had moved to the big city in search of their fortunes and hadn't yet quite "made it." At least in Chennai they took the time to erect their own shelters, rather than simply appropriate other peoples' property as is often seen in US ghettos. This is an inside view of the elaborately carved, multistory entrance gate to one of Chennai's largest Hindu temples. All the figures depicted represented certain key players and teachings from the Hindu beliefs. 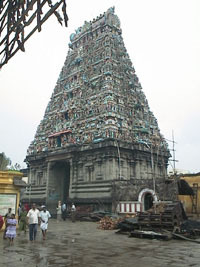 The temple itself encompasses an entire city block, surrounded by a massive wall, and is open from above to the elements. All visitors are expected to remove their shoes before entering, so I tracked around on the wet and muddy ground in bare feet. I confess that I jumped into the shower very quickly upon returning to the hotel! 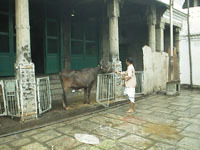 A worshiper feeding one of the many cows that wandered throughout the temple grounds. Hindu believers hold these animals in very high regard, paying homage to them above all other creatures, save humans. There were cows on the streets of Chennai everywhere. A cow definitely lives a better life (and has a longer future) in India than on a Chicago feedlot! 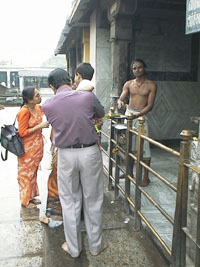 Through my guide and interpreter, Sushila, I asked for and received permission from this temple priest (on the right) to photograph him distributing ashes. This ritual involves worshipers dabbing some ashes on their foreheads and/or faces as a ceremonial reminder of the almost universal religious concept of "from ashes you came, and to ashes you shall return." All Hindus are cremated upon their death, rather than buried, so this is an especially meaningful symbolic gesture to them. The priests come from the highest Hindu caste, the Brahmans, an even higher caste than the one from which emerged India's previous kings and other eminent personages. 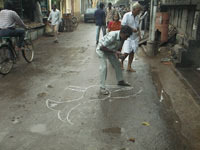 Sushila explained that this man was drawing a peacock on the street in front of the temple entrance as a gift to the temple. He couldn't afford a monetary gift, so this was his way of showing respect and honoring his gods. 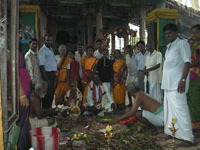 When a married couple reaches their 50th wedding anniversary, they can renew their vows to each other in a very special Hindu ceremony. This couple (seated cross-legged), having long ago passed the 50 year milestone, kindly gave me permission to photograph this celebration of their devotion to each other. The other attendees were mostly close family.